We are keeping things rolling getting ready for the big football game in a couple weeks! The football fun has been going strong around here… we’re Packer fans from Jersey and today we’ve got a big game. We’re headed to my brothers in a bit to cheer our team on and of course eat some great food! 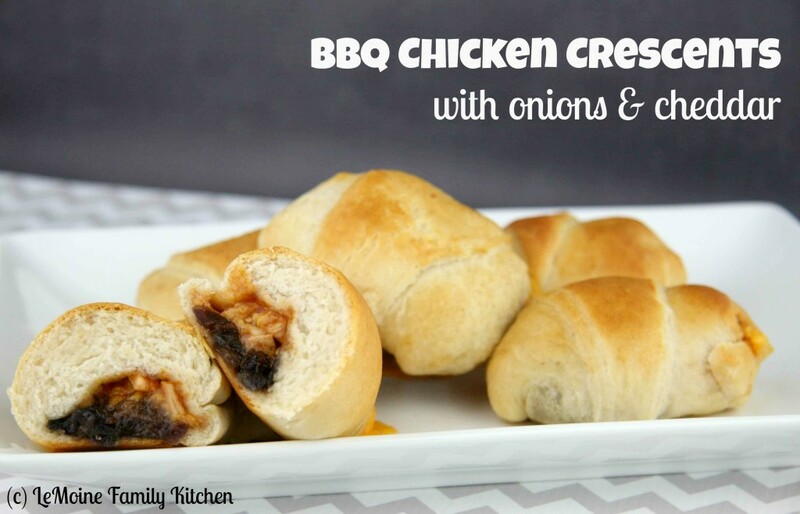 I’m bringing these, BBQ Chicken Crescents with Onions & Cheddar!!! 5 ingredients, minutes to throw together and so good!! I absolutely love the flavor combo that I used here, I’ve used it many times before in all sorts of forms. Today I decided to throw it all together in fun little crescent bundles! Store bought roasted chicken, sharp Vermont cheddar, bbq sauce and crescent rolls! The sweet smoky bbq sauce with the sharp cheddar and the sweet onions, its just heavenly! These will surely fly of the plate! In a large pan, over medium low heat, add the butter and onions. Sauté until softened. Season with a little salt and pepper. Unroll the crescents on a lined baking sheet. Place a small amount off bbq sauce, a slice of chicken, a piece of cheddar and a bit of the onions. Roll the crescents up and close up the ends so that all the filling stays in there.